Most people have done it in a car, either their own or an open vehicle, many have done it on foot, and some have even done it on horseback. A growing trend is to do it on a bicycle, and after trying it for myself a couple of times I can see why. 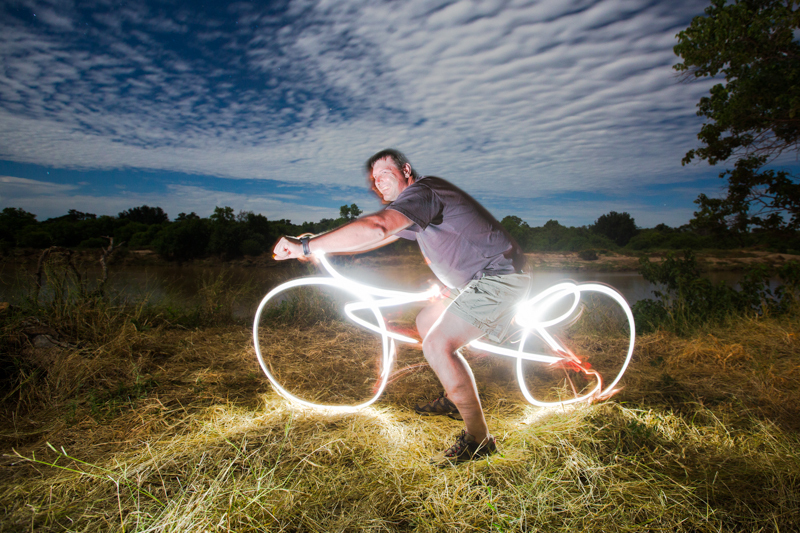 In fact, cycling has become one of my favourite ways to go on safari. Be prepared to get muddy if you come during the rainy season. Villiers and I were first introduced to the joys of cycle safaris with Cycle Mashatu in the Tuli Block, Botswana, where the semi-arid, open landscape lends itself to whizzing along game trails and in and out of dry riverbeds. I’ll admit to being apprehensive about safety at first, not from the enormous elephant herds, (very) big cats and other wild animals out there, but from my own ineptitude on a proper bicycle. I know how to ride, of course, but all those clicking gears and levers on a mountain bike can be pretty intimidating. Thankfully, it isn’t rocket science, and I soon learned that all you really need is a decent level of fitness and a healthy sense of adventure. 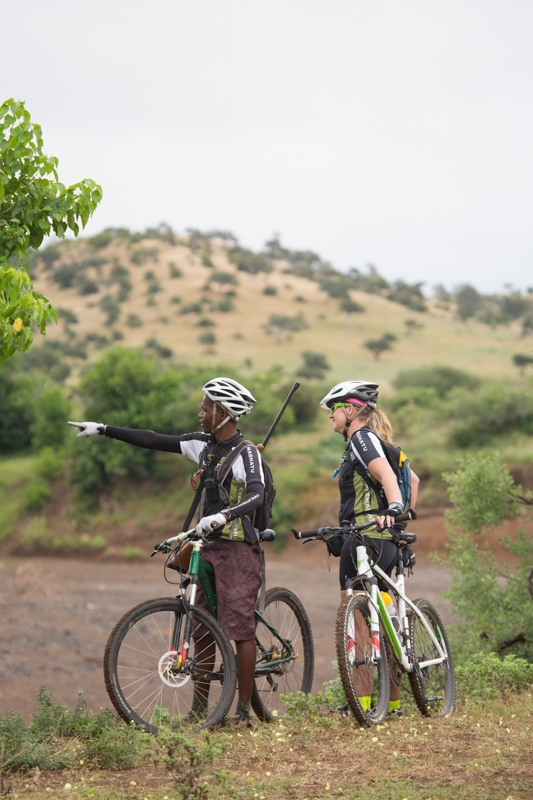 Going on a cycle safari is one of the best ways to make new friends. 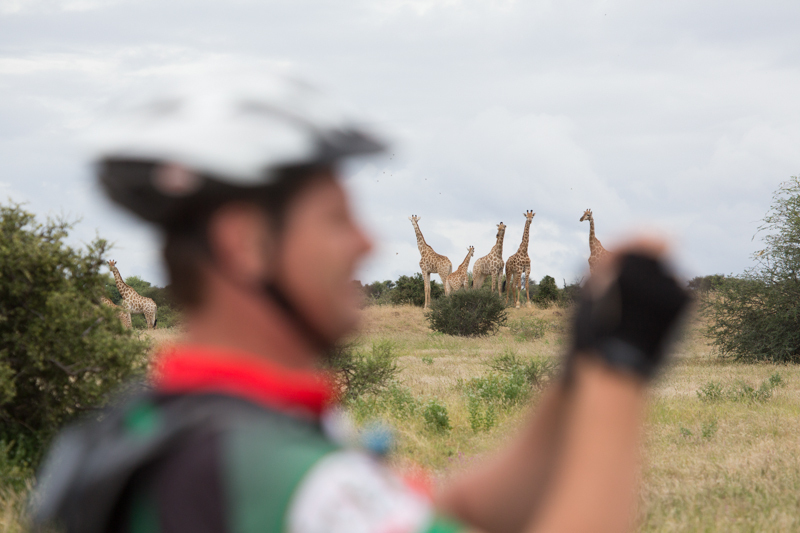 You might expect game-viewing from the back of a bike to be counter-productive – surely the animals run away? – but just like driving, walking, or game viewing from horseback, a good guide and a bit of luck is all you need. 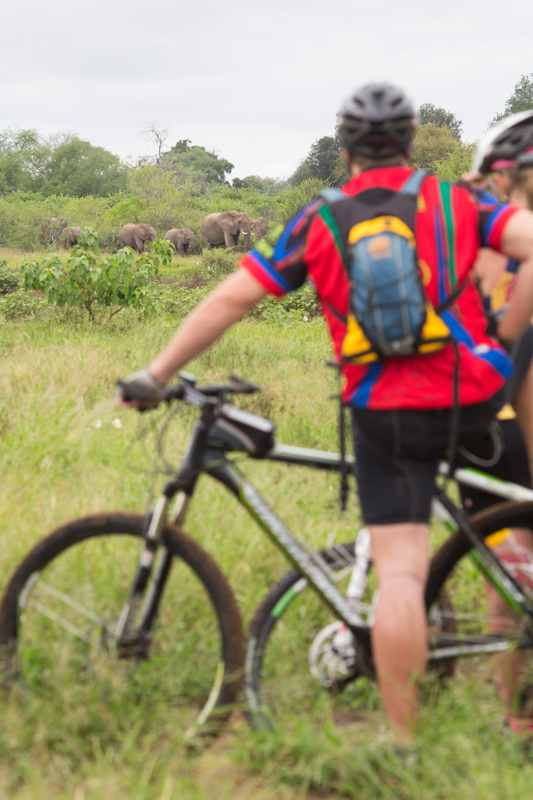 It’s a remarkably peaceful way to explore the veld, and though you’re bound to face the inevitable puncture (or six), cycling along game trails and well-worn elephant paths makes for a much more intimate experience than your average game drive. It’s faster (and quieter) than walking, so it’s easy to cover more ground to explore further, and with so many people more comfortable on a bicycle than on a horse, it’s easy to see why cycle safaris are becoming the order of the day. We ended the evenings with fun and games in camp. Mashatu is usually very green between February and May. It’s impractical to ride with a large digital SLR camera and long lens, so bring a compact camera that you can put in the back of one of your cycle shirt pockets or a small bag that fastens to the frame of the bike. You see more from the back of a mountain bike than you think. From Pretoria, take the N1 north to Polokwane, then follow the R521 to Pont Drift Border Post via Mokgwadi (previously known as Dendron), Vivo and Alldays (480 km, ± 5½ hours). Park your car in no-man’s land, where you’ll be fetched by one of the Cycle Mashatu team. If the Limpopo is in flood, visitors cross by means of a cable car (R40/person). Remember your vehicle registration papers. No 4×4 required. 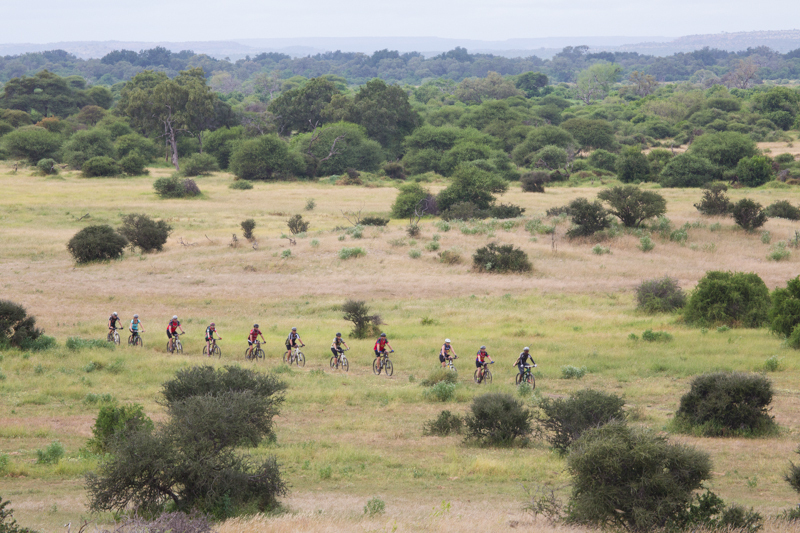 The terrain is very open, making it ideal for game viewing from a mountain bike. The best time is between April and September, when daytime temperatures are generally pleasant. It can become unbearably hot and very wet between October and March. Remember to pack warm clothes for the evenings, especially between May and August. 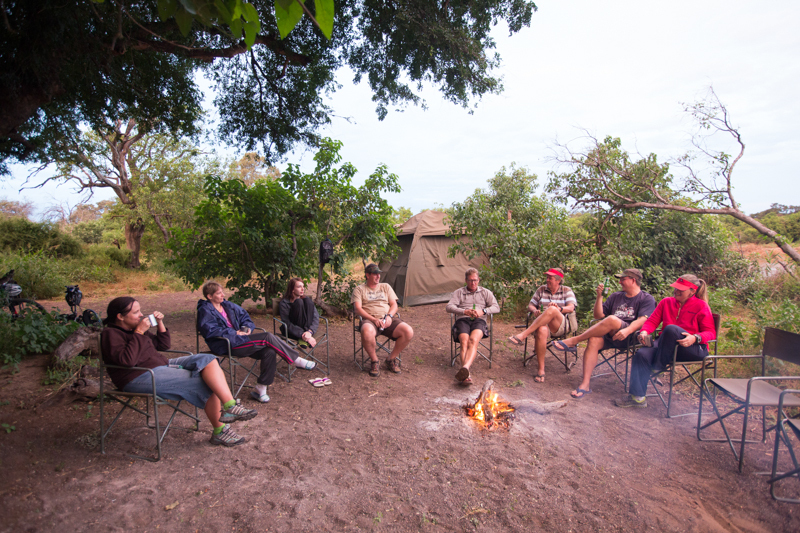 The camps are well located and equipped, and the perfect place put your feet up. 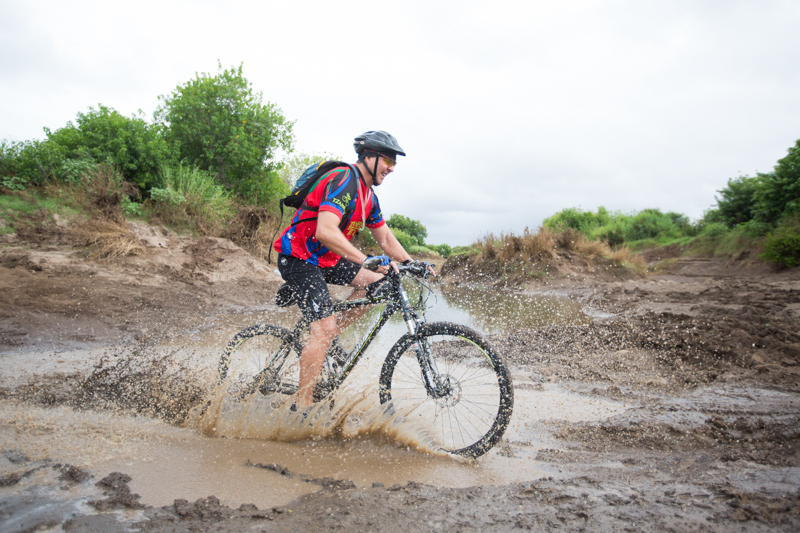 The Mashatu Wilderness Trail is a four-day, three-night mountain biking safari that starts on Tuesdays or Fridays throughout the year. Pick-up time on arrival day is 13:00 at Pont Drift and drop-off on the day of departure is between 09:00 and 10:00 at the same spot, so it’s not necessary to arrange accommodation prior or after the trip if you live in Gauteng. Accommodation is in an unfenced camp with comfortable two-man dome tents for the first two nights and, weather providing, an open-air boma (made from leadwood tree trunks) on the last night. Ablution facilities include hot water bucket showers and neat pit latrines complete with toilet seats. It’s not uncommon to ride past large herds of elephants. Cost: R5350/person, which includes three meals a day, guided excursions (bike rides in the mornings and short game drives to a sundowner spot in the evenings) and vehicle backup. No children under the age of 12. Maximum 16 riders. Don’t be scared of flat tires. It will happen, but it’s all part of the fun! 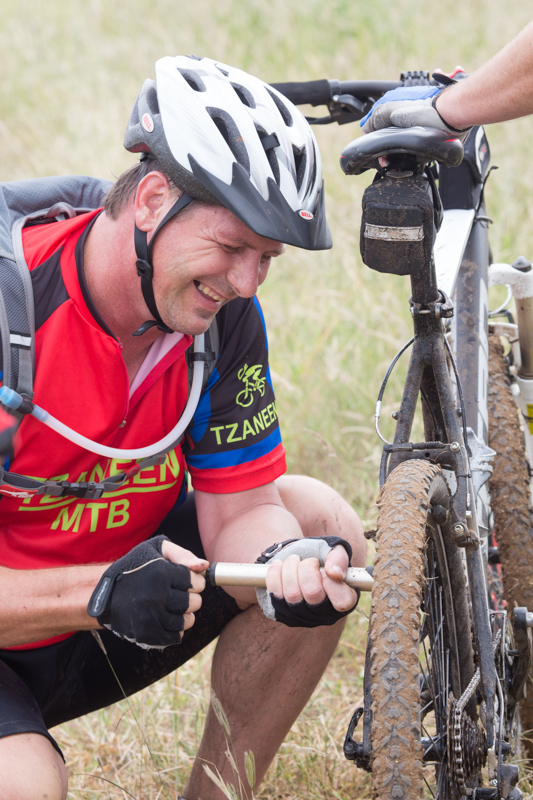 You’re welcome to bring your own mountain bike, but tubeless tires are highly recommended. Alternatively you can rent a 29 inch GT Karakorum trail bike for R250/day (3 days). Also order a Cycle Mashatu cycling shirt for R450. Rides are between 15 and 35 kilometres a day at a leisurely pace for game viewing. 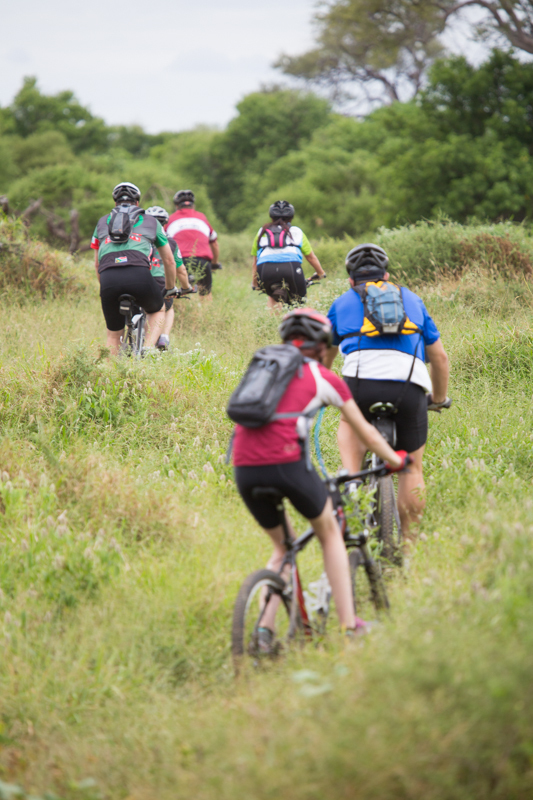 Though you don’t need to be super-fit for the trail, for maximum enjoyment, it’s recommended that you spend some time on your mountain bike in the months leading up to the trip. You’re always in the good hands of an experienced, armed guide.